I was born in Alessandria, Italy, where I first became acquainted with Greek and Roman history attending the local Liceo Classico. I took BA (2006) and MA (2008) degrees in Classics at the Università degli Studi di Torino (studying at the Collegio Einaudi), after which I moved to Durham University for three years. There I received a PhD in Classics and Ancient History (awarded in January 2012). After my viva in 2011 I moved to Athens for a few months, as School Student at the British School at Athens, before taking up an Alexander von Humboldt Post-Doctoral Fellowship in Mannheim in 2012. I moved to Edinburgh in 2013 to take up a Chancellor’s Fellowship in Classics, and I was made a Reader in Greek History in 2017. In 2014 I was appointed Member of the Royal Society of Edinburgh Young Academy of Scotland and I have been, since January 2015, Co-Chair of the Arts and Humanities in Society Working Group. In 2015 I was awarded a Philip Leverhulme Prize in recognition of my research achievements. I was in spring 2017 Visiting Professor of Greek History at the Università degli Studi di Torino. 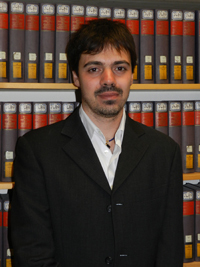 In later 2017 I was appointed Fellow of the Yong Academy of Europe, and awarded both the Royal Society of Edinburgh's Thomas Reid Medal for Excellence in Arts, Humanities and Social Sciences, and the University of Edinburgh Chancellor’s Rising Star Award, in recognition of my research on Greek politics and law. I have been awarded (as Co-I, with Douglas Cairns) an ERC grant for a project on 'Honour in Classical Greece'. I regularly write opinion pieces for Il Fatto Quotidiano, an Italian national newspaper. My early research, culminated in the publication of his first monograph (The Documents in the Attic Orators, OUP 2013), was on key documents about Athenian law and institutions. This work was the necessary underpinning for my wider work on Greek political, legal and economic institutions, particularly on the impact of political decision making and legislation on society more broadly. My extensive commentary of Demosthenes’ Against Leptines (De Gruyter 2016) sheds new light on Athenian politics, law and public economy. The study of the social and economic underpinnings of political institutions is also matched in my work by research into ancient philosophical reflections on these topics, culminated in a co-authored commentary of book IV of Aristotle’s Politics. Further articles and edited volumes make contributions to the study of the legacy of Athenian thought, to intedisciplinary work in Greek history and the social sciences, and on a variety of topics from the status of slaves and freedmen in Athens all the way to the development of polis institutions in the Archaic period and of ideologies and practices of law-making vis-à-visdemocratization. I am at the moment concentrating on two main projects. First (funded by the Philip Leverhulme Prize), my next monograph will study the deliberative structures of Athenian decision-making. Since the nineteenth century Greek democracy, and Athenian democracy in particular, despite the acknowledgement of the important of debate and deliberation, has been taken as a prime model of contestatory majoritarianism. It is widely assumed that major issues of public policy were decided by narrow majorities, reflecting polarized public debates and pluralistic preferences among a citizenship divided on ideological lines. With this project, I make the case that political decision-making in Greek assemblies, at all levels, was fundamentally deliberative and aimed to foster consensus. It was not primarily aggregative in nature, but was rather institutionally and ideologically structured around deliberative principles. Through a thorough historical analysis both of the institutional mechanisms and of the value system that governed Greek, and particularly Athenian, political decision-making, I aim to make a contribution to contemporary debates on deliberative democracy, its practical feasibility, its normative appeal, and its advantages and pitfalls. Second, I am working with Douglas Cairns on a new project about honour (and inequality) in ancient Greece, funded by a grant of the European Research Council. My interest in these topics stems from research on the Athenian honour system and public economy for my commentary on Demosthenes’ Against Leptines. We aim to break new ground in ancient Greek social, political, and intellectual history by bringing recent findings on the links between economic inequality and its psycho-social effects to bear on the society, culture, and economy of classical Athens. Our aim is to understand how the Athenian polis, Athenian society, and Athens-based authors responded to inequalities of wealth and their corresponding inequalities of status in the way that they lived their lives, developed their political and cultural institutions, and thought about issues of justice, equality, and social cohesion. This project aims to relate what can be gleaned about the economic realities of the classical polis to the exploration of the interpersonal, social, and political tensions that such inequality will have created, with particular reference to Athenian conceptions of honour and its role in Athenian law, life, politics, and thought. PhD, Department of Classics and Ancient History, Durham University (October 2008 – October 2011; awarded: 2012), 'The documents in the public speeches of Demosthenes: authenticity and tradition', supervised by Edward M. Harris and Paola Ceccarelli, examined by Christopher Carey and Andrej Petrovic (passed without corrections). MA in Filologia e Letterature dell'Antichità, Università degli Studi di Torino (October 2006 - July 2008), 'L’orazione demostenica Contro Leptine. Testo critico, traduzione e commento', supervised by Lucio Bertelli, 110/110 e lode con dignità di stampa. BA in Lettere Classiche, Università degli Studi di Torino (October 2003 - October 2006), 'L’orazione demostenica Contro Timocrate. Traduzione e commento', supervised by Lucio Bertelli, 110/110 e lode. Language Instructor: Advanced Greek 2A/3A (Aristophanes' Wasps). Language Instructor: Advanced Greek 2A/3A (Aeschylus' Eumenides). Guest Lecturer: Law and Society in Classical Athens. Teaching Assistant: Myth Memory and History. Teaching Assistant: Athens Sparta and the Greek world.